I had a really fun coffee catch up today with the lovely Alana from Pretty Purple Polish. She's in Canberra for the weekend and she even visited Bankstown Nail Supplies for me before leaving Sydney. She picked up some extra OPI DS Original's, one of my missing China Glaze Kaleidoscope polishes, as well as two polishes I've wanted to get for ages, China Glaze Ruby Pumps and Emerald Sparkle. Oh and OPI Ink too! Awesome nail day! Thanks so much Alana! 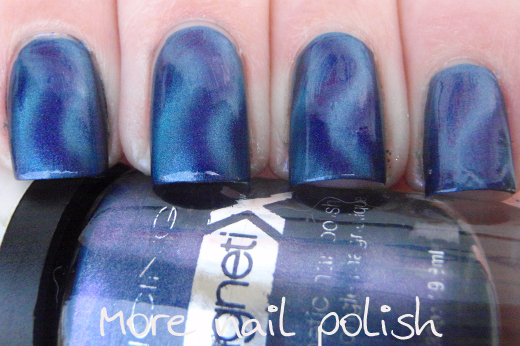 But today's polish is one I received as part of a swap with a lovely reader in the USA. 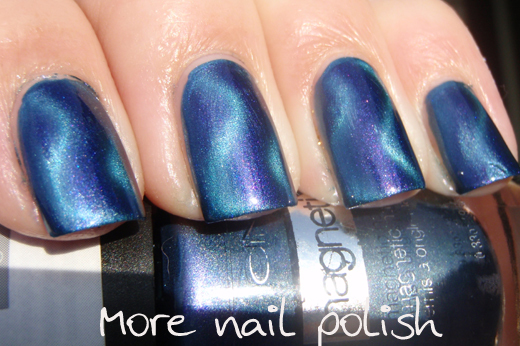 She grabbed me some of the Icing and Claires magnetix polishes. Specifically the thing I really wanted was the curvy magnet. For some reason I feel compelled to own every sort of magnet style that exists. 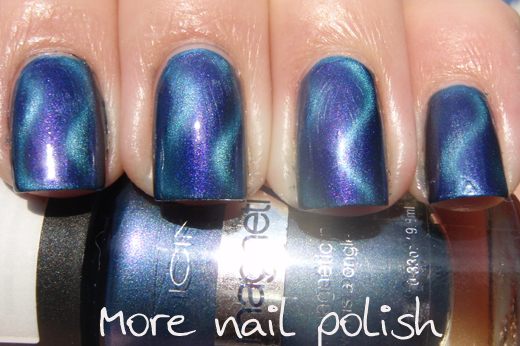 I really love this wavy magnet design when it's applied vertically down the nail, and in the blue polish it just looks like water ripples. 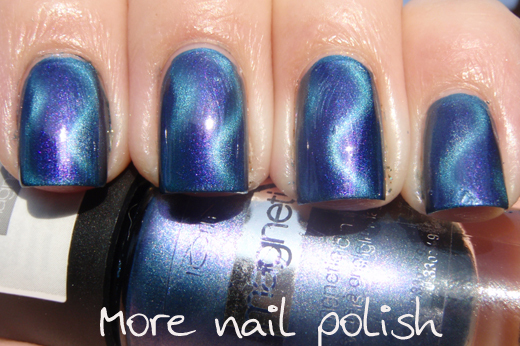 Unfortunately, by the time I met up with Alana, I was in day two of this polish and I had some serious tip wear and two chips off the edges - I felt terrible not having a perfect mani when meeting up with a nail buddy! This polish didn't seem to last very long on me, but generally that's not an issue as I change my polish so regularly anyway. Also, I'm thinking of placing another order with Layla Cosmetics in Italy. 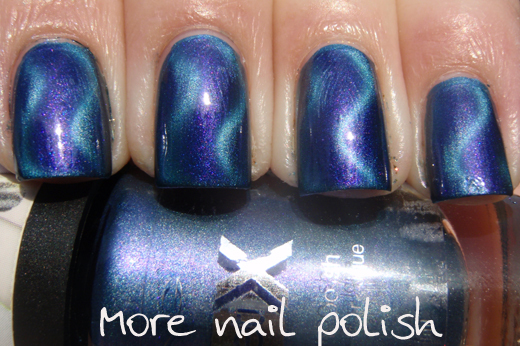 I want to get the just released Mirror effect polishes. I'm sure they will just be like most other chrome polishes, but the only real chrome polishes I have are an old Revlon and China Glaze 2030. I missed China Glaze Millennium, and Layla's Number 8 below looks to be a nice silver chrome. I'm guessing they will be great for stamping just like other chrome polishes are - that's the main reason I want the colour selection. So if other Aussies want in on the order, just let me know (that way we can share the international shipping). Don't forget they have the holos too. The holos are 11.90 Euro and the mirrors are 12.20 Euro. Email me if you want in. I'm already looking forward to next Easter for another catch up!